The autonomous passenger drone is designed to handle short trips over busy cities. 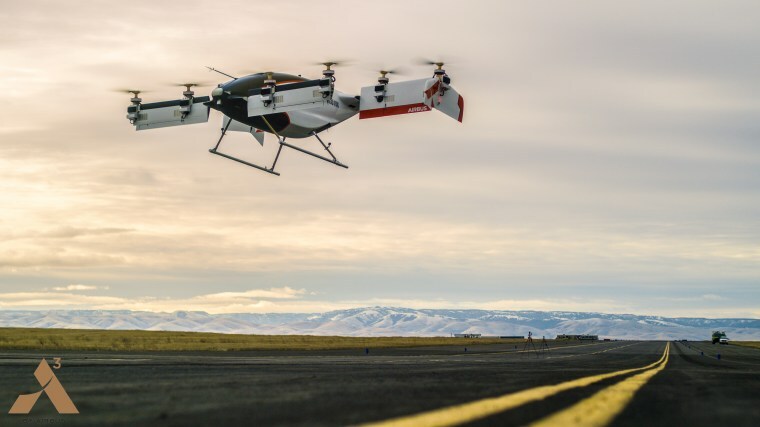 Air taxis that can soar over rush-hour traffic took another step closer to reality when an autonomous passenger drone designed by Airbus’s Vahana team made its maiden flight in Pendleton, Oregon last month. Newly released video of the 53-second test shows the electric aircraft hovering at a height of 16 feet before returning to the ground. The test and a second one on Feb. 1 showed that the “Alpha One” prototype can take off and land vertically. Future tests will gauge its ability to transition to horizontal flight. The Vahana project — run by a Silicon Valley-based outpost of Airbus called A³ — aims to create passenger aircraft that can handle short trips over crowded cities. Alpha One, which has eight rotors and weighs about 1,600 pounds, is designed to have a cruising speed of 125 miles an hour and a range of about 30 miles. A production-ready version of the drone could be ready by the early 2020s, Lovering said. Airbus envisions a future in which travelers use a smartphone app to summon a self-driving air taxi like Vahana. Once the taxi is ordered up, it would zoom to a nearby landing pad. After the passenger boards and the taxi has calculated the best route to the destination, the taxi would return to the air — adjusting course, as necessary, to avoid birds or other aircraft in the area. It’s premature to predict the cost of taking an air taxi, but a promotional video released by Airbus last year shows a woman hailing a Vahana and selecting an 18-minute flight priced at $77. But before air taxis can take to the skies, their creators must figure out how the craft can safely negotiate densely populated areas, Robbins said. That means developing regulations for passenger air travel, infrastructure such as landing pads, and safety features like collision-avoidance technology. Airbus isn’t the only company developing on-demand air taxis. German aviation startup Volocopter sent an air taxi on a five-minute test flight in Dubai last October — and showed off the technology last month by briefly flying one of its taxis across the stage at the Consumer Electronics Show in Las Vegas. Uber plans to begin testing similar vehicles in Dubai and Dallas in 2020.